Step 1 Heat the oven 375 degrees. Step 2 Remove the inner ribs and stems of the kale leaves. Tear each leaf by hand into bite-size pieces. Separate a half pound and place in a bowl with one-fourth cup olive oil and one-fourth teaspoon salt and one-eighth teaspoon pepper, or to taste. Stir until the leaves are coated, then spread the leaves evenly onto a sheet pan. Place the sheet pan in the center of the oven and cook, flipping the leaves occasionally, until they are crisp and some of the ends are darkened, about 10 minutes. Remove from the oven and cool. Step 3 In a small bowl, combine the yogurt, the lemon zest and the ground cumin seed to taste. Season with one-fourth teaspoon salt and one-eighth teaspoon pepper, or to taste. Refrigerate, covered, until ready to use. Step 4In a large pot, add the garlic and serrano chiles to the remaining olive oil. Cook over medium heat until the garlic is cooked but not brown, then add the remaining kale and chicken broth. Cook the kale until wilted, stirring occasionally, about 15 minutes. Drain and keep warm. Step 5Spoon equal dollops of the yogurt into 6 large bowls. With a slotted spoon, divide the cooked kale into each bowl centered on top of the yogurt. Carefully crown the cooked kale with the crispy kale leaves from the oven. Drizzle extra-virgin olive oil around the kale, and very finely grate the cheese over the crisp kale leaves, working fast so the cheese "snow" does not melt. Serve immediately. In Recipes-list.com we have selected the most viewed recipes from category - Quick and easy Vegetables . Enjoy the best recipes specially selected for you! 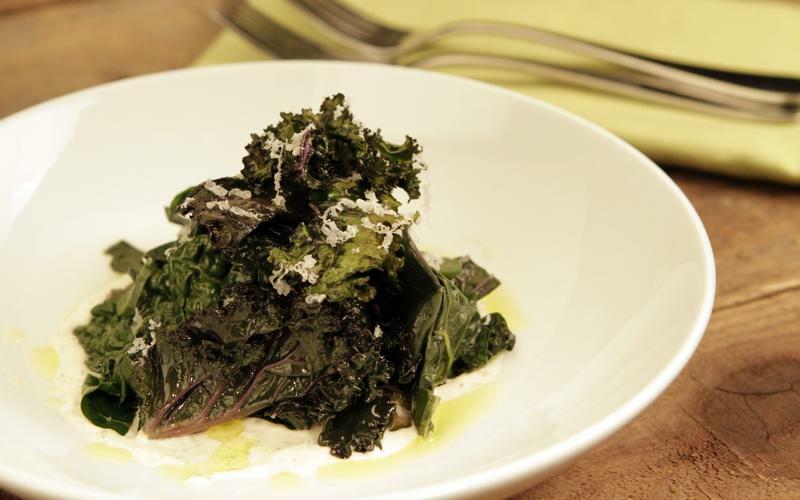 Braised kale with Garrotxa snow is the right choice that will satisfy all your claims.